Grimm had it's Christmas episode this past Friday, and it featured a lot of the holiday traditions. Parties, choir singing, fruitcake, presents, and oh yeah goblins. Spoilers after the break. The episode starts off with Monroe and Rosalee watching his train set, which Monroe uses to deliver an invitation to finally take off and go on their honeymoon, and Rosalee happily accepts and they wonder how others are enjoying the holidays. Which segues into a Christmas party at someone's house in Portland, where everyone is having fun, and then there's a late night delivery of a large present. It gets brought in, and left under the tree. Then something breaks out from inside the box, lets its friends in, and they wreak havok in the house. When the husband of the couple that live there goes down to check it out while his wife calls 911, he gets assaulted after seeing what look like monsters. Here's the "next week on Grimm" (from last week) that shows most of the plot points. Nick and Hank get called in, and after speaking to the victims and doing their detective thing, they figure out the general area these goblins are showing up, and get to a house in time to capture one. Juliet pumps it full of tranquilizer and uses an animal cage to lock it up in Monroe and Rosalee's garage, while the boys head to the trailer to figure out what it is. Turns out the fake present was a clue, because they're a Greek wesen (using a Christmas themed Trojan horse). It turns out a small percentage of them go through a rougher puberty than the rest and go full level-2 woge (so everyone can see them) and go nuts during the 12 days of Christmas (because of the shorter days or something). Not being ok with beheading children, they find that the Grimm who wrote about them felt the same and knew a king who had a non-lethal solution: after eating a lot of a sweek German cake with fruit they would go into a sugary-food coma and when they woke up after sunrise they'd be back to normal, for good. Which means there's a reason for fruitcake! While the boys are researching, the goblin wakes up and breaks out (or is broken out) of his cage and is joined by his 2 friends. Juliet and Rosalee are left to defend the house and manage to knock out two of them and stop the 3rd one from destroying the train set (which Rosalee is now also knowledgable on having picked it up from her husband, which was a cute moment). This leads to them discovered a medical alert bracelet one of them dropped, which leads Nick and Hank to the home of one of the parents. After the usual woge / "you're a Grimm!" freakout, they find out where the boys will be, and try to get ready for them. So Nick and Hank commandeer a fruitcake truck (we'll get to that later), awesomely named "Yule Love It", and lure the boys from the church after they woge out and start destroying things and pulling down the tree. They trap them in the truck and when they check the next morning, they see them revert back to normal and all is well. 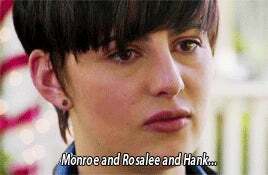 In other goings on, Trubel with help from Josh and Bud identify several members of the racist wesen group out to get Monroe and Rosalee, including names and type of wesen, which they hand to Nick. He wants to use the law to go after them if possible but if not, he'll go in as a Grimm. Juliet has another stomach cramp and mentions some naseau, and when Rosalee asks if she might be pregnant she realizes it could have happened when she slept with Nick while looking like Adalind. Except even Rosalee isn't sure how far the transformation goes and if it was more than just looking like her. The episode ends with her looking at a pregnancy test, and then we see her face in a mirror without seeing the result, but c'mon, does anyone expect her to not be pregnant? The Captain and Nick have what is basically a fun "my mom could beat up/kill your mom" talk. Basically Renard wants his mom to be able to see her grand daughter but Nick doesn't know where his mom is and neither wants their moms fighting or killing each other. Especially, as Renard correctly deduces, since the royals have probably figured out she Kelly has the baby. They also talk about what to do with Sgt. Wu, who is getting closer and closer to figuring things out, and Renard just says he doesn't want Wu to know abou thim. Josh has decided he needs to go back home and try to get back to his life and confront whatever is waiting there for him. 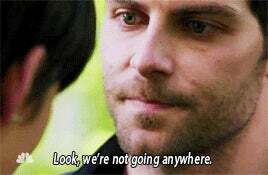 After helping Trubel out with the racist-wesen (I know it's more specieist, but since it's an allegory for racism, that's how I'll call it) research including hitting a guy over the head with a rock and hoping he was woge'd, Josh gets a tour of the trailer, and then Trubel tells Nick she's going to go with Josh to help him, and they have a heartfelt goodbye, and then she and Josh take off in aunt Marie's car that Nick lends them. Let's hope she comes back, the show is better with her in it. When Josh was in the trailer with Trubel, I got a betrayal vibe. 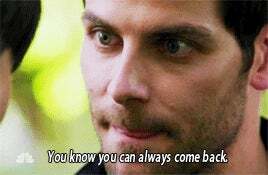 They didn't show everything so it's possible those wesen at his house caught him before he got on that bus, anyone else wondering about him? That fruitcake truck either sells other season-based items throughout the year or is garaged most of the year and is just a side hobby and not an actual business because I don't see a lot of demand for fruitcake outside of Christmas (or even during). Still love the name though. I really enjoyed the "my mom could kill your mom" conversation between Sean and Nick. Very schoolyard, but in their case it's not an exageration.